It’s one of the best things that has happened to all students. It will help us educationally and it exposes us to a wider range of learning. I would say we are advancing to the 21st century — a King’s man. The project commenced in 2015 with the Maths department heavily involved in this first phase of the mobile eLearning program for King’s College Lagos. From the onset, the school leadership had decided to introduce the program with the teachers at the centre of all activities, and a strong emphasis on the national curriculum for all lesson planning. This phase of the work was deployed using the Afrelib Learn@Work program approach. This approach is designed to increase the effectiveness of teachers and teaching. It tackles the lack of adequate support and training for teachers to create and deliver lessons in classrooms fit for the demands of a 21st century knowledge economy. In recognising the varying levels of competencies amongst the teachers and in order to start from a standard baseline, a series of workshops were delivered. Workshop topics covered included eLearning content, platforms, content creation tools and publishing tools. 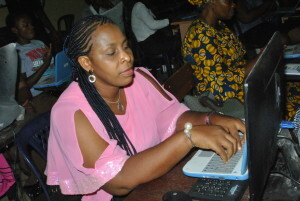 Building on the introduction, teachers used the national curriculum as basis for creating eLearning content modules including narrated voice-overs. Each teacher prepared paper-based lesson plans which had been previously submitted and approved by the Maths Department Head Of Subject (HOS). An iterative and highly collaborative series of classes including use of readily available tools to create, record and publish eLearning content. This phase is deployed using the Afrelib Learner Program approach. It is designed to support the secondary schools curriculum and tackles the loss of confidence by students and parents that the current education system cannot make a real difference to their life choices. 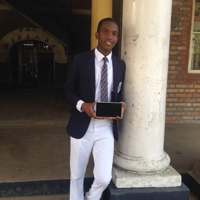 This program is designed to ensure that African schools are able to benefit from the ever-increasing global availability of digital resources and learning tools. The kind of digital resources that brings good writing to life, introduces immersive media rich learning resources or engages the mind and imagination of a young learner. Using readily available tools and technology in conjunction with Afrelib Connect Program approach, we are able to rapidly deploy mobile learning hubs in almost any location allowing more children to have access to learning. Creating these learning hubs without the usual bottlenecks of power supply and internet connectivity provide a simple yet highly effective solution. 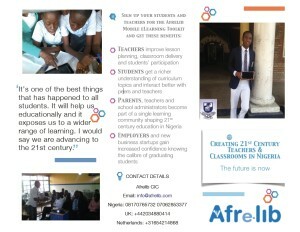 Using Afrelib ACE (Afrelib Community Environment), we are able to connect teachers and students even outside of the classroom so that learning and feedback can continue to take place beyond the classroom lesson. This community starts in the school and extends between schools across the country. This social learning approach will enable continuous improvement based on feedback from teachers, students and school administrators.